Formula wines of the east and west are hitting wine shelves… Learn how to craft the best formula wine that you can and avoid stability pitfalls that can create stress in the cellar. Photos collected by DG Winemaking. I would consider any wine product that requires formula approval by the TTB a “formula wine.” Many wines that include flavoring and/or coloring additions require formula approval by the TTB in order to receive a Certificate of Label Approval (COLA) for that product. Several years ago, I found that formula wines were often used as an outlet for subpar quality wines. Wines with noticeable flaws or excessive bitterness were dosed with sugar and some sort of flavor addition. The flaws were assumed hidden behind the more intense flavors associated with the formulated product. Today’s wine market, however, paints a slightly different picture. Grocery shelves are lined with niche wines, many of them formulated to create an unique experience for the wine consumer. 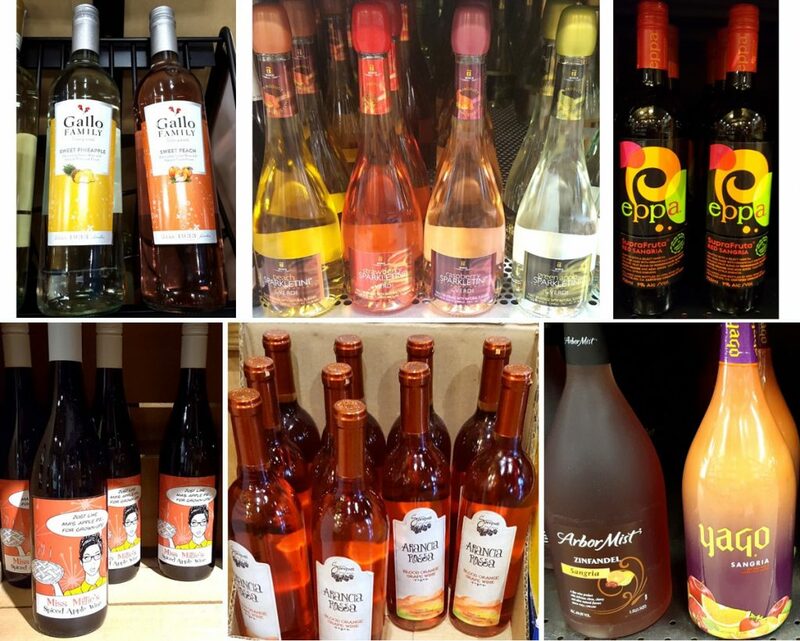 Flavored bubblies, blue wine, pre-bottled sangrias without any sliced fruit inside and even pumpkin spice wines are hitting the shelves. What once seemed like a wine fad has become a new reality. While the overall quality of formula wines seems to be improving, a potential for things to go wrong still exists. Visually, a quick glance at the shelves reveals wines with precipitates, odd colors, and cloudiness or haze. Humans are visual creatures, and as anyone with tartrate precipitation knows, such oddities can sway a consumer from a purchase. Why are these problems so prevalent in formula wines? Often, winemakers turn to their mixology skills in an attempt to capture a commercial scale “wine cocktail” in the bottle. However, what may work well on a lab bench, or in our kitchens, does not correlate to stability in the bottle. The addition of ingredients, like juices, spices, or concentrates to an alcoholic beverage may not be stable long term. In a drink made to last an hour or two, these ingredients may work well together. But in a bottled beverage intended to sit on the shelves at room temperature for several months, these ingredients may separate or cause chemical instabilities. To enhance stability for a longer period of time, specific processing techniques should be planned. Alternatively, ingredients should be reviewed and altered to emulate ingredients in a wine cocktail. Why do Formula Wines Experience Instabilities? When looking at a formula wine like a grape table wine, we fail to address how wine’s chemical complexity can influence the way various [ingredient] additions stay in the wine. Formula wines, especially those that integrate ingredients like juice, concentrates, or purees experience stability problems because the addition of those ingredients alters the wine’s basic chemistry. Changes to alcohol content, pH, and acid chemistry can dramatically alter a wine’s color, acidity, and stability of other chemical constituents like tannins and proteins. The article, Formulating Untraditional Wines and Wine Products addresses wine constituents that contribute to instabilities in formula wines. Additionally, this article reviews several different ingredients that can be used to craft a formula wine. One should also consider the variability in ingredients. How an ingredient was processed can dramatically change its solubility in the wine. Knowing these properties can be a key advantage producing a formula wine. 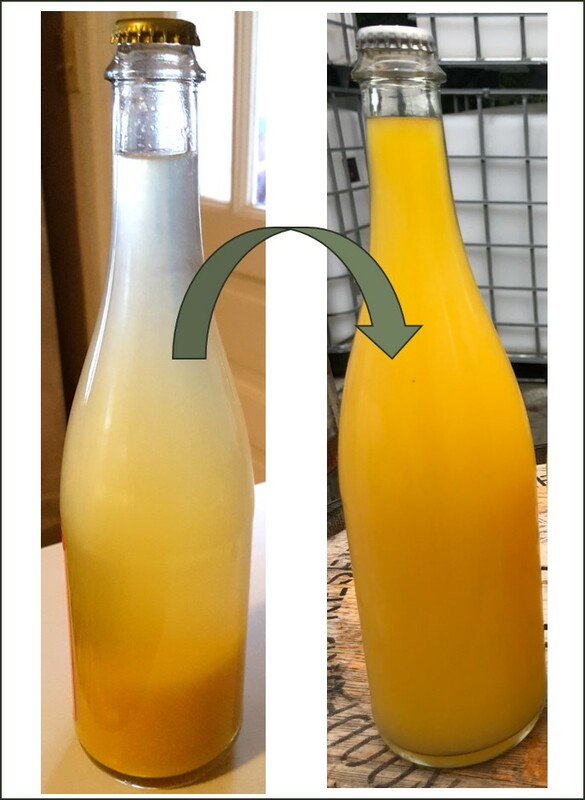 Through several bench trials and various ingredient tests, we were able to fix a color and flavor instability and craft an appealing, stable formula wine that emulates a mimosa. Photos provided by DG Winemaking. One formula wine I’ve had the pleasure of working on is an orange mimosa product. The orange color was unstable and frequently dropped out of solution (as a precipitate). This caused an obvious visual problem with the wine. The orange flavor would lose intensity over time. With a little re-formulation, we first addressed the orange flavor with an ingredient change. To last through processing and into the bottle, the orange flavor needed greater intensity pre-bottling to ensure the flavor was noticeable post-bottling. The color and appearance of the wine has taken some additional work and experimentation. This has required numerous bench trials with several ingredients at various dosage rates. We have also done a fair amount of comparison testing to the first product made and engage in regular sensory evaluations to assess the wine’s quality. Excessive notes are taken during processing and bottling operations to better define how this product is made. At our current stage in development, the orange flavor sustains the desired shelf-life of the wine. While we continue to monitor the appearance through simple shelf-life testing as a long-term evaluation technique, we are also making small tweaks to the recipe with each newly produced batch. Today, the product retains its strong orange color and opaque appearance. No packaging sleeve needed to hide how good this product looks (and tastes!). This is a great example of how to take an average product with creativity and good intention behind it, to a great product that is appealing to many consumers. It also illustrates that when a wine is made intentionally, these formulated products may take several tries to get them “perfect.” Like actual table wines, these wine products require some work, knowledge, observation, and regular enhancement. Each new batch is a learning experience. How Can You Improve Your Formula Wines? First, go into making your formula wine intentionally. Regardless of what you want to make, commit to making a clean base wine that will serve the purpose of being a formula product. Use good winemaking techniques, sanitation practices, and create flaw-free wines. Second, set aside time to conduct bench trials and sensory evaluations with your team. For some wines, it may be prudent to make a small batch of your wine product and allow it to sit for simple shelf-life testing. Some of my consulting services offer assistance with bench trials and shelf-life testing strategies. I would also evaluate your preservatives, and determine if you are using the best microbial control options. Avoiding spoilage can be a tricky obstacle depending on the ingredients in the wine. The important part embedded in this step is time. To craft a good product, you should give yourself some time for production and evaluation. It’s not something you want to rush in a two-week window. Third, consider ingredient changes. While juices or spices are convenient to find, wine quality may be enhanced with careful and deliberate ingredient selection. Sometimes trying two or three different ingredients intended for the same effect may be enlightening. Review ingredient options and some considerations in the DGW article, Formulating Untraditional Wines and Wine Products, or contact me for consulting options that include connecting you with good ingredient vendors. For further assistance via DGW consulting services, please contact info@dgwinemaking.com.